The aftermath of Aidan's death continued to be felt tonight. Carla struggled stepping into his shoes at the factory, unable to break the news of his death to a supplier whilst Michelle was assured that digging into work was what Carla needed to take her mind off things. Sophie meanwhile was living with the guilt of a message Aidan sent before his death, wondering why she wasn't at the leaving party. When Johnny attempted to visit his son's flat he ended up having a panic attack, as he continues to struggle with his son's death and a reason for why it happened. When Sophie does rather innocently visit Johnny and tell him about the text message, he is extremely quick to place the blame of Aidan's death at her door. It's clear to us and Jenny that his harsh words are those of a grieving man, but it doesn't make it any better to take and Sophie is completely stunned by his anger and quite devastated herself by what's being forced upon her shoulders. Michelle meanwhile questions whether going forward with the wedding is the right thing to do in the face of such a tragedy, and more anguish is in store for the Connor's as Michelle comes across a letter from Aidan. A family meeting is called and the letter is opened to reveal an apology from Aidan. Eagle eyed fans will remember Aidan posting off a letter back in February. Kate also remembers this and the Connor's come to the realization that the letter was done around the same time as Carla came back needing a kidney. 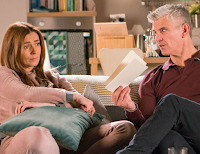 Intially carla is angry as she wrongly believes the suicide note was as a result of the kidney request, and Johnny explains the letter was done before then and giving Carla his kidney was what saved Aidan's life at the time. In his mind it allowed him to do a useful, kind thing, to help another family member. A small side note here; This is one of the first times Rana has shared scenes with the rest of the Connor's. Yes it's under horrible circumstances, but it is still a scene. The last time Kate had someone involved in family matters it was Sophie, and even that was because she was basically tagging along as a person just there. Rana's here because she's part of Kate's family. She's also currently staying with Kate as she grieves for Aidan, and hopefully we'll have happier scenes of her with the Connor's in the future. Kate's anger over Aidan dying is transferred over to Carla, with Michelle and Carla berating her for her words. It is clear that her anger is serving as a defence mechanism whilst Kate continues to struggle with her brother's death, and it's interesting to see the Connor's different ways of coping. Carla is throwing herself into the factory & not allowing herself to think about it, Johnny is desperate for a reason as to why Aidan killed himself and Kate is just angry with everything and everyone, because the person she is truly angry with for leaving her she can't confront. Michelle meanwhile eventually admits to Robert that whilst she and Carla were at the flat, she came across Aidan's will and he's left everything to Alya. Speaking of her she continued down her slippery path tonight. She's first annoyed when Carla cancels the order that Aidan had signed off on and is soon berating her taking command of the factory to Josh. He meanwhile is busy sewing Alya up as his alibi and continuing to trade blows with Shona. She's very much in tune to his game, and the harder Josh tries to go with proclaiming his love for Alya, the more determined it makes her to get justice for David. When Alya is eventually told the news about Underworld, there's no doubt it will cause fireworks between her and the Connor's. David's now former ex-girlfriend Emma shows no sign of going anywhere anytime soon. Gail and Sally tried to gently broach the topic of her moving out now that her relationship with David has ended. But never one to heed the message, and with nowhere else to go, Emma instead offered to be a lodger; she'd pay money towards the rent and food if Gail agreed to let her stay. Of course she said yes despite some initial reservations. In the cafe Shona broached the subject of Emma getting herself checked for STD's which was met with a mixed response by Gail and Emma. And whilst Shona was trying to do her bit on the outside, attempting a word with Imran to aid David's case, he continued to struggle being remanded in custody. He unintentionally attacked his cellmate when he unintentionally startled David. He's later warning David that inside there are no friends. Shona visits David and wants him to tell the truth of what Josh has done, since it would be just cause to ease some of his legal problems. David is still understandably reluctant, and Shona points out how wrong it is that Josh is currently free with David behind bars when it should really be the other way around. Unfortunately David can pick up enough from Shona's words to realize she has indeed had a confrontation with Josh. He isn't at all happy with Shona's behaviour and she is quick to apologize, and David like Shona is tuned in to Josh's game. Unfortunately even with this in mind he still refuses to come forward and tell the police what Josh did. With Shona continuing to shoot daggers around, Alya confronts her and proclaims that Shona is just angry for Josh causing issues between her and Josh. Twisting the conversation back onto her, Shona muses she and David had so many problems because they rushed into their relationship. It is obvious Shona is worried for what Josh could do to Alya, but there is no what she's going to listen to anything bad against Josh.